Si vous avez besoin de contacteurs électriques avec 3 bobines de bobine de 24 Vca, équipés d'une grande capacité pour les utilisations électriques générales, les moteurs, l'éclairage ou les installations de ventilation, entre autres, il est au bon endroit. Dans cette section, vous trouverez une grande variété de contacteurs triphasés avec une capacité de courant comprise entre 9A et 95A. 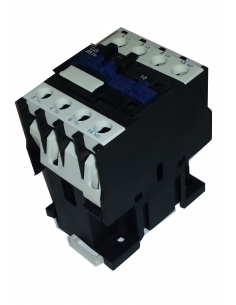 Three-phase electrical contactor with 85% silver contacts for electrical, heating, illumination, ventilation or general purpose 3-pin contacts with a current rating of 9A category AC3 or 25A category AC1, with 24Vac coil, the contactor is equipped with an open auxiliary contact (NO). Electric three-phase contactor equipped with high-capacity contacts, with 85% silver, for control of electric motors, heating, lighting, ventilation, or general purpose, with 3 poles with a current capacity of 9A category AC3 or 25A category AC1, With 24Vac coil, the contactor is equipped with a closed auxiliary contact (NC). Contactor trifásico eléctrico dotado de contactos de alta capacidad, con un 85% de plata, para mando de motores eléctricos, calefacción, iluminación, ventilación, o usos generales, de 3 polos con una capacidad de corriente de 12A categoría AC3 o 25A categoría AC1, con bobina 24Vac, el contactor está equipado con un contacto auxiliar abierto (NA). Electric three-phase contactor equipped with high-capacity contacts, with 85% silver, for control of electric motors, heating, lighting, ventilation, or general purpose, with 3 poles with a current capacity of 18A category AC3 or 32A category AC1, with 24Vac coil, the contactor is equipped with an open auxiliary contact (NO). Contactor trifásico eléctrico dotado de contactos de alta capacidad, con un 85% de plata, para mando de motores eléctricos, calefacción, iluminación, ventilación, o usos generales, de 3 polos con una capacidad de corriente de 18A categoría AC3 o 32A categoría AC1, con bobina 24Vac, el contactor está equipado con un contacto auxiliar cerrado (NC). Electric three-phase contactor equipped with high-capacity contacts, with 85% silver, for control of electric motors, heating, lighting, ventilation, or general purpose, with 3 poles with a current capacity of 25A category AC3 or 40A category AC1, with 24Vac coil, open auxiliary contact (NO). Electric three-phase contactor equipped with high-capacity contacts, with 85% silver, for control of electric motors, heating, lighting, ventilation, or general purpose, with 3 poles with a current capacity of 25A category AC3 or 40A category AC1, With 24Vac coil, the contactor is equipped with a closed auxiliary contact (NC). Electric three-phase contactor equipped with high-capacity contacts, with 85% silver, for control of electric motors, heating, lighting, ventilation, or general purpose, with 3 poles with a current capacity of 32A category AC3 or 50A category AC1, with 24Vac coil, open auxiliary contact (NO). Electric three-phase contactor equipped with high-capacity contacts, with 85% silver, for control of electric motors, heating, lighting, ventilation, or general purpose, with 3 poles with a current capacity of 32A category AC3 or 50A category AC1, With 24Vac coil, the contactor is equipped with a closed auxiliary contact (NC). Electric three-phase contactor equipped with high-capacity contacts, with 85% silver, for control of electric motors, heating, lighting, ventilation, or general purpose, with 3 poles with a current capacity of 40A category AC3 or 60A category AC1, with 24Vac coil, with 2 auxiliary contacts, one open (NO) and one closed (NC). 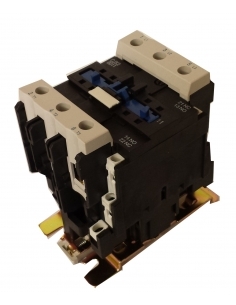 Three-phase electrical contactor with high capacity contacts, 85% silver, for control of electric motors, heating, lighting, ventilation, or general applications, 3-pole with a current capacity of 50A category AC3 or 80A category AC1, with 24Vac coil, the contactor is equipped with 2 auxiliary contacts, one open (NA) and one closed (NC). 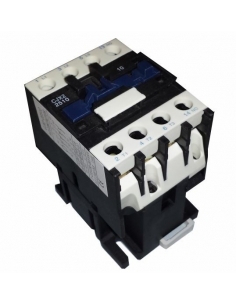 Three-phase electrical contactor with high capacity contacts, 85% silver, for control of electric motors, heating, lighting, ventilation or general use, 3-pole with a current capacity of 65A category AC3 or 80A category AC1, with 24Vac coil, the contactor is equipped with 2 auxiliary contacts, one open (NA) and one closed (NC). Electric three-phase contactor equipped with high-capacity contacts, with 85% silver, for control of electric motors, heating, lighting, ventilation, or general purpose, with 3 poles with a current capacity of 80A category AC3 or 125A category AC1, with 24Vac coil, the contactor is equipped with 2 auxiliary contacts, one open (NO) and one closed (NC). Electric three-phase contactor equipped with high-capacity contacts, with 85% silver, for control of electric motors, heating, lighting, ventilation, or general purpose, with 3 poles with a current capacity of 95A category AC3 or 125A category AC1, with 24Vac coil, the contactor is equipped with 2 auxiliary contacts, one open (NO) and one closed (NC).